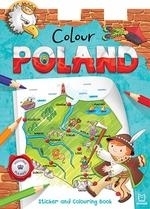 Colour Poland Sticker and Colouring Activity Book is a wonderful souvenir from Poland for children. With this book children can: • Explore the most important places and attractions in Poland. • Consolidate their knowledge about famous monuments, legends and historical figures. • Colour the pictures and recall the visited places. • Have fun playing with stickers. My First Poland Sticker and Colouring Book!